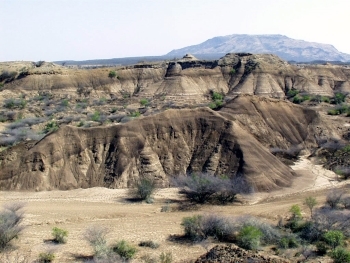 The Lower Valley of the Omo River is a prehistoric site where many hominid fossils have been found. They are of fundamental importance in the study of human evolution. Several hominid fossils and archaeological localities, dating to the Pliocene and Pleistocene, have been excavated by French and American teams. Fossils belonging to the genera Australopithecine and Homo have been found at several archaeological sites, as well as tools made from quartzite, the oldest of which date back to about 2.4 million years ago. In December 2018, I visited the Omo Valley in far southwestern Ethiopia, including the Hamar people (known for their bull-jumping ceremonies and where the women curl and color their hair with ochre clay and butter), Daasanach people (the most southernly of the tribes who live in Ethiopia’s Omo Valley, where I attended a Dimi ceremony), Karo people (known for painting their faces and bodies with white chalk, red ochre, yellow mineral rock and black charcoal) and Mursi people (known for the lip plates and outrageous headdresses worn mostly by elderly women). As best as I could tell, the Karo village that I visited sat above the lower valley of the Omo River. I arranged my tour with Fitsum Ashebir, the founder of Omo Valley Tours, one of the best guides with whom I have ever worked; instead of paying a per photo fee (as so many seem to do in the Omo Valley), Fitsum, who is well known by all the village chiefs, arranged for us to pay a flat fee that allowed unlimited photos and made for a much more pleasant experience than I understand was experienced by some friends who paid per camera photo (where the subjects counts camera clicks). 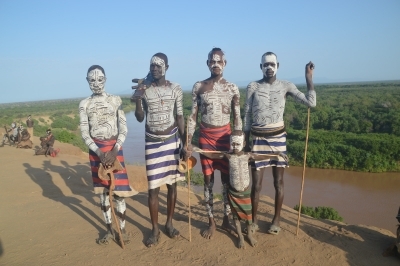 A visit to the lower Omo valley is a visit to another world. The environment is harsh and wild but the people are welcoming. When I first visited there was no electricity, no telephone and only rudimentary facilities for visitors. Now that is all changing and it is firmly on the tourist trail. That does not detract from the region's beauty and it is still an incredible privilege to spend time there. But the arrival of the television (albeit powered from unpredictable and noisy generators) will mean that the sense of otherness that both the tribes and tourists experience when coming face to face with each other will quickly disappear. “Lower Valley of the Omo” is the only WHS I know of inscribed for reason A (In this case as a site of early hominid remains), but visited almost entirely for reason B (In this case to see the remarkable tribes of the region). The problem this creates in determining whether one has actually visited the “site” is increased because the site’s inscription details are remarkably thin about its location - the “Lower Valley of the Omo” covers a very large area! Yet the 1980 evaluation is a simple 1.5 page document in English and French which merely states “Location – The Region of Gemu Gofa” - no “buffer zones” or “management plans here”! (This was very typical of early inscriptions - the ICOMOS evaluation for Harer in 2006 was 16 pages long and also has a 74mb “Nomination file” for consultation!). The current UNESCO Web site does provide a grid reference (N4 48 E35 58) which I traced to the “town” of Kelem west of the Omo River just north of Lake Turkana. Now Wikipedia states “Omorate (also known as Kelem) is a village in Southern Ethiopia”. But could such a single location constitute the entire site of the “Lower Omo Valley”? in which the remains have been preserved. (If this link gets "blocked" by a password request do a Google search on "Shungura Formation Earthscape" and select what is probably the first returned site - it should then "let you through"). The location of Kelem seems to be approximately where the words “Type area” appears on the map – but none of the Web articles on Omo Hominids which I have found actually refer to digs at “Kelem” itself. The fossils found in these beds seem mainly to relate to a period of 1.5 to 4.5 million years (myrs) ago. Arambourg’s Omo finds included an Australopithacus (= “Southern Ape”, a pre-Homo genus) c 2.5 myrs old and this description about the work of the Omo Research Expedition in the early 1970s, including a nice description of the Omo valley landscape, is consistent with discoveries from this sort of period although it too doesn’t actually provide a detailed location for their work. But another frequent “Omo related” hominid reference on the Web was to the Kibish Rock Formation where very significant earliest known examples of Homo Sapiens were found in 1967 (known as "Omo I +II"). But these are "only" c130,000/190,000 years old and Kibish itself is further north than Kelem - near Chibele on the map I believe. It appears that the Shungura formation contains many layers (or “Tuffs”) of different ages and that the “Kibish” is one such “Tuff” yielding relatively “modern” hominid remains. tribe consisting of around 50 grass/reed huts. A local told us that Kelem was a further 24kms west and that the normal way to reach it by motorised transport was along a N/S road on the west bank of the Omo rather than from Omorate. He did also confirm that there had been "skeletons" discovered there and seemed to be vaguely aware of UNESCO and World Heritage. In the distance we could see the slightly rising ground of the Shungura formation - but it was unattainable for us. The previous day we had been further north to visit the Karo tribe whose village was on a high bluff above the east bank of the Omo - a few miles away on the other side would be the Kibish formation. On other days we visited the Konso and Mursi tribes - each of which have other "formations" named after them with their own hominid discoveries! So, have we "visited" or "seen" the "Lower Valley of the Omo" WHS?? Well we certainly didn't reach the specific grid reference point cited on the UNESCO web site nor did we see any of the "depressions" left after paleo-anthropologists had excavated for the bones of early hominids! But would doing so have gained us anything? 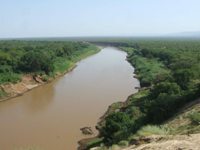 However, we did see the type of country in which such hominid-bearing formations are situated, and we certainly saw (and crossed) the Omo river in its lower valley (photo). More importantly to us, what we DID have was the tremendous experience of seeing the tribes currently living in this remote area. In all honesty, that is the main reason why anyone other than a paleo-anthropologist is going to visit the "Lower Valley of the Omo" - but strictly I can't use photos of the Mursi lip plates or the Hamar whipping and bull-jumping ceremonies etc since none of these is relevant to this WHS!! You should, however, try to get there to see these things as soon as you can. I fear that 2007 was already several years "too late" for the most authentic sights, and change, in the form of new roads and more and more tourists, is happening almost before your eyes. Early Hominid Remains: "discovery of the earliest known fossil fragments of Homo Sapiens that have been dated circa 195,000 years old." Leakey Family: Richard Leakey was invited by Haile Selassie to search for fossils there (1967). Middle Pleistocene: The oldest hominid remains are 200,000 years old (Ionian). Pliocene: The oldest sediments are 3.5 Million years old (Pliocene). 18 Community Members have visited.